We’ve all been on set were all of your camera equipment is spread out on the floor in various black camera bags, hidden in a side pocket, or out of reach. To solve this problem we have made a DIY equipment cart which can be used in a studio or on set. The cart we used can be found on amazon: it is 75cm long, 70cm tall, the width is 35cm, and has 3 shelves. The wheels that come with this cart work for the amount of weight we are going to store on it, but you can always add some heavy duty wheels if you want. We added pieces of carpet to each shelf, creating a softer surface for our equipment to be placed onto, and so it wouldn’t roll around. We kept the top shelf of the cart clear so when setting up our camera rig we had a place for all of the pieces of equipment to go, whilst we assembled the rig on a tripod. One thing we did attach to the top shelf was a flat headed screwdriver so anytime you need to add or remove the tripod plate you don’t need to be searching around for a coin in your pocket. Also, we added a bunch of Allen keys we use for our camera rigs. Most equipment on the cart can be accessed from both sides, but we have made one side the front and one the back. We’ve done this so everything will be setup in the same order, and if you are in a small place you can park it up correctly so you still have access to everything. The second shelf is where most of the action is happening. On the right hand side we have all of the chargers we use which are connected to a extension cable that hangs off the side when not being used. The main charger we use is for our Sony NP batteries as we use them to power our camera via a dummy battery, which you can find a video about that here. The charger we has a battery level percentage which comes in very handy. The box behind has extra batteries and chargers that we do not use often, and it is also used to store the batteries and chargers when in transport. Once a battery is fully charged they move to a section on the left hand side. We divided this section up with some white backing card, but cardboard would do the same job. Having it divided clearly shows were the charged batteries go. Next we have a small section for the lenses we are using on the shoot. For our short films we switch between a 35, 58, and 85mm and having them on hand in a safe place saves time finding them in a bag. When a lens is being used, the caps from the lens are left on the cart, so they don’t go missing. Since camera batteries and lenses are the thing you will will change the most, having a dedicated space allows everything to be stored correctly and safely. It’s also a lot easier to direct someone to one place when changing a battery or lens, instead of them trying to find a battery in the pocket of a camera bag. On the second shelf we also added LED lights so when it gets dark we can still see where everything goes. The bottom shelf is where we store small equipment cases, as these normally still have power and audio cables, clips, and extra accessories inside which we might still need. Next we have a place for our tool bag which is always handy on set, and the final box is where the flat batteries go when all of the charges are being used. Having this on a separate shelf makes sure the flat batteries do not get mixed with the charged ones. On the front of the cart we have a plastic tube which holds our coloured gels, a velcro tape holder, a tin to store pens. These are all connect via bolts and wing nuts so everything can be easily removed if needed. We also have a place for all of our metal clips and pegs to go. These are clipped on a piece of card so when in transport they can all be taken out of a camera bag and clipped to the cart. This cart works well for us in our studio or on our short films. We already had some of the materials we used for this cart like the carpet and bolts, but we have estimated it would cost around £60 to make it from scratch and you can just keep adding to it until it suits you. A professional equipment cart can cost over £1000, but this is because they are being used on films which has camera equipment that are much heavier and can cost hundreds of thousands pounds, so you will probably want to use a cart that costs thousands. We still have a few things we want to add to this cart and we would love to hear your suggestions. 🎵 http://bit.ly/track-tell-me - Click here to download this episode's track. Check out Premiumbeat.com to discover a huge range of exclusive royalty free music! Gunshots: one of the most popular visual effects techniques used on YouTube. Getting gunshots to look great can take some tweaking - and achieving a realistic gunshot effect in the dark is even more difficult. But there are some things YOU can do to help achieve a realistic gunshot in the dark. A gunshot is essentially a small explosion. And an explosion primarily produces light and sound. The sound part of this technique is pretty straight forward. You download a gunshot sound effect, sync it to the muzzle flash, tweak the sound a bit, and away you go. The explosion from the gunshot produces a massive amount of light in a split second, and in a dark scene this will be amplified. You CAN add some fake light spill in post-production for your daytime shots. You can do this by duplicating your layer, mask around the subject where you want it to brighten, brighten it up with something like a curves or exposure adjustment, and feather out the mask to blend it all together. It only shows for a single frame so it works well enough. But this won’t work for a dark environment because you simply can’t fake a realistic fall-off of light. The initial idea was to use a portable camera flash. It has a button on it to test the flash so the plan was to hit the flash whenever the subject fires. After trying this out we soon realised that because of the small differences in shutter speed, frame rate, and rolling shutter, the flash was giving us shutter interference, resulting in a frame that looked like this. No good. Next on the list was a flashlight. This was getting us closer to the result but it simply wasn’t bright enough. Finally we tried this LED panel from Aputure. The great thing about this light for this effect in particular is that it has a light switch separate from the intensity dial. Some cheaper lights have a dial which clicks on then turns up. But if you can get a light which switches on and off with a simple click, it will make this effect a lot easier. So the light must be super bright. You want it to highlight your subjects face and light up some of the background for maximum effect. We dialled it in so it didn’t completely blow out but produced a very hot highlight. Now the most important part of making this effect look good are the steps you’ll take to capture the light flash. A muzzle flash from the gun happens directly after pulling the trigger, but BEFORE the recoil from the explosion. The recoil is the pressure of the gun jolting your wrist back, so the steps are very important to make it look realistic. Pull the trigger, then freeze in place. Flick the light on, then flick the light off. Then simulate the recoil. Rinse and repeat. 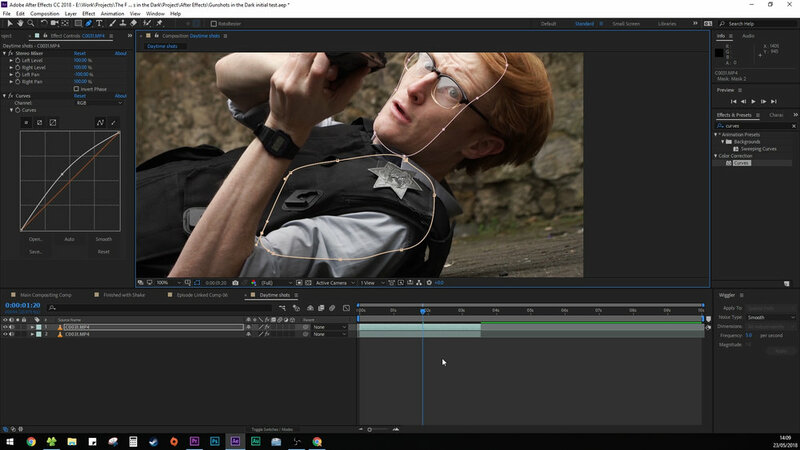 In your editor you will make a cut on the frame the trigger is pulled. Then go to where the light is at its brightest, make a cut, delete the footage in between and join it together. Then scroll along and find the moment of recoil. Make a cut and take out the gap here too. The light should be on screen for only a single frame, and this is where you will add your muzzle flash and smoke elements. One downside to this effect is that we were only able to produce it from a static camera angle. We tested a few different ways to simulate the light in a moving shot: one by shooting a take without the light, then shooting a take with the light on, and trying to match up the takes. But unless the takes are near identical, the cut looks far too jarring. So if you guys think you have a solution for producing this in a moving shot, let us know in the comments below, or better yet, show us how you did it in a video! Visual effects work most effectively when they EMBED into the physical scene. Compositing effects onto footage without ANY physical interaction will result in tacky-looking VFX. So if you want your visual effects to shine, think about what those effects would produce in the real-world and try to replicate it. 🚀 http://bit.ly/tflrs-ricochet - Give your action scenes extra impact with RocketStock’s muzzle flash and gun smoke VFX library, Ricochet. This high-caliber pack features over 450 stunning elements.